For real. Three times in the last six months, we've found random flowers outside our door, waiting by our car in the mornings. And once, an old man came to the door with hardly an explanation and handed fresh flowers to us. So the question is - who is the mysterious flower benefactor??? Someone trying to repay an ancient horticultural debt? Complete strangers mysteriously drawn to our lovenest? And other plausible theories. Unlike pots of gold at the end of a rainbow and not bothering to wear clothes in public, this is NOT too good to be true. Somewhere in the Provo/Orem area, $5000 is hidden (as well as an iPad, sweet treats, gift certificates to local businesses, etc. along the way), and the first person to find it WINS! I'm always down for a good 'ole fashioned Adventure with a capital A, and this one sounds awesome. Duncan explains more about it on his web page here. 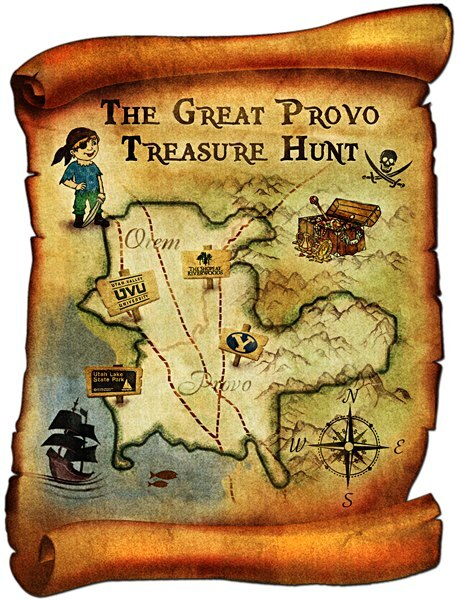 Get hints and clues for the treasure on twitter (@ProvoTreasure) and on facebook (Provo Treasure Hunt). See you at the Provo treasure hunt? I am so completely stoked about this! thanks for the heads up! and tell your secret flower sender to come my way. How awesome to have a secret flower admirer! I've seen this--about the Provo Treasure Hunt. For some reason they followed me on twitter. Looks like tons of fun! Good finding the gold! And the flower giver. Secret flowers?? How fun! i bet it is your hubby, he is just getting other people to give them to you :) And man, I want to be apart of this treasure hunt! Flowers? My paranoid mind would automatically think someone is going to kill me. See how my mind works!? that's so exciting getting flowers all the time - you lucky girl you! haha. It's probably your hubby being your secret admirer. But hey if you ever find out, let me know. This is some exciting stuff, haha! That treasure hunt looks like way too much fun.